This week felt like it was never going to end, but it also had high points. Time spent watching the Olympics… Phelps becoming the most decorated Olympian, the USA winning gold for women’s gymnastics, fall shoe shopping and my best friend (of forever) became an uncle to the cutest little angel. My weekend will consist of a trip to the zoo, a picnic in the park and time spent poolside. What are your weekend plans? Those fruit kabobs look delicous! Your pony is adorable and I love those fruit kabobs!! 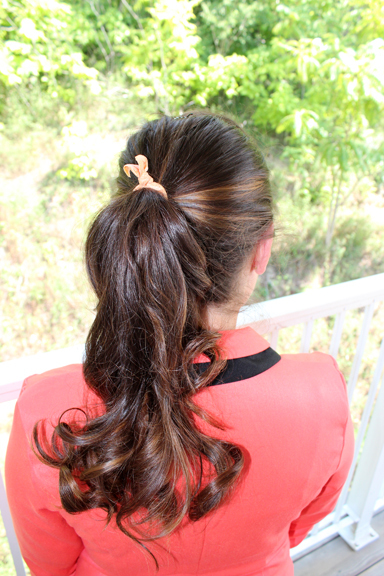 Love your ponytail! I am dying for my hair to just grow another 6 inches longer so I can do more cute hairstyles, like yours! aww i love trips to the zoo, enjoy! LOVE that dark green nail polish - such a pretty color! Bouncy ponytails are so fun! I wear my hair up so much in the summer, this is a great way to make it look cute and get it off of my shoulders! Love your pony and congrats to your BFF on becoming an uncle!!!!! I just became an aunt and it is amazing spoiling the baby. I would love to devour all those fruit kabobs! OMG that handmade collar necklace is gorgeous! your hair is so beautiful!! and so is that necklace! i love it! Love the hair and the green polish. I favor green though....I'm going to drive to Kentucky to visit a long lost friend. I love... the bouncy pony, the grey polish, and the fruit kabobs. mm, your blog makes me hungry! Your ponytail is so pretty and I love your nail polish color!